Fresh and light is the kind of summer dish that we all need with this weather lately. 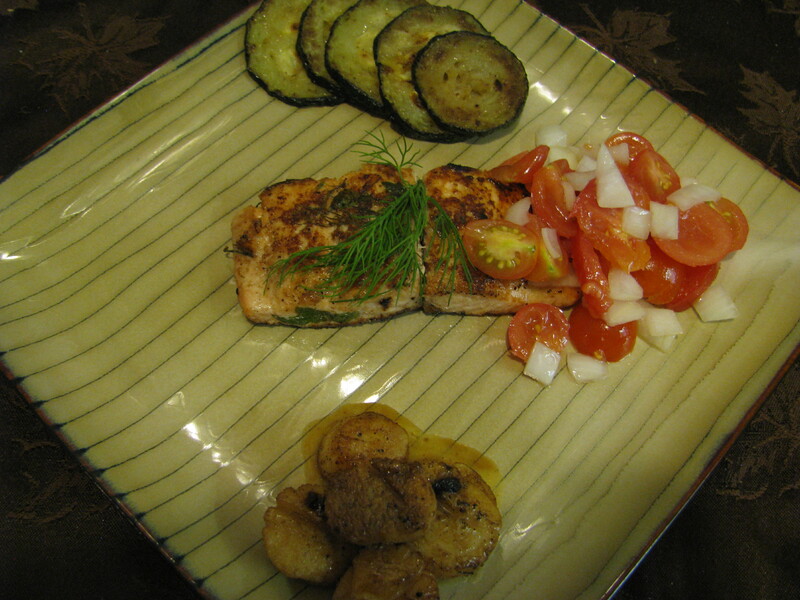 For this meal I used my skillet to cook the salmon. I seasoned the fish with fresh lemon juice, garlic powder, salt, pepper, fresh dill and some extra virgin olive oil. Place it on a med high heat with a little bit of butter, and just remember salmon gets cooked fast. After that in the same pan with same drippings, I placed the scallops. I let it cook for about 3 minutes and then added some white wine (Tip: Remember to always cook with wine you drink with, don’t use the stuff that you don’t like because the flavorings will diminish). Make sure to cook off the alcohol content. On another skillet I did fresh zucchini from the garden, added some olive oil, garlic, salt and pepper. I placed everything on a plate with some fresh cherry tomatoes from my garden with some white onion salad. The dish is refreshing and yet satisfying. Enjoy!! Being a pescetarian, I am always looking for new fish recipes to try. This looks delish!! Going to make it today!